It seems hard to believe that our trip is half over. Today, we returned to the city hospital to work as a group so Tammy could translate for us. We made rounds in the pediatric ward and watched a skilled nurse easily start several IV’s in babies, unlike yesterday. She wore a cap with a blue velvet band, indicating she has a Bachelor’s degree in nursing. Then we went to the Labor and Delivery unit. When the nurses learned I had experience in labor and delivery, they assigned us to a 28-year-old woman having her fourth baby who had just been admitted. The doctor examined her, said she was halfway dilated and broke her water. We went on rounds and I checked her internally before lunch. No change. We felt her contractions and I tried to listen to the baby’s heartbeat with my new stethoscope, but couldn’t hear anything. There is no fetal monitoring available here. She looked very comfortable, so we had a leisurely lunch. When we returned at 2 p.m., she was writhing in bed in pain and looked like she was in the transition stage. I asked for a sterile glove, checked her, and she was totally dilated. I asked her to push and the baby’s head crowned, so I told her to blow so she wouldn’t have the baby in bed. The Dominican nurse said it was time for her to go to the delivery room. We watched in amazement as the mother stood up, and walked in her sandals to the room, laid on the table, and put her feet in the stirrups. The nurse then told me that the nurses do all the normal deliveries rather than the physician, and motioned me to deliver the baby. 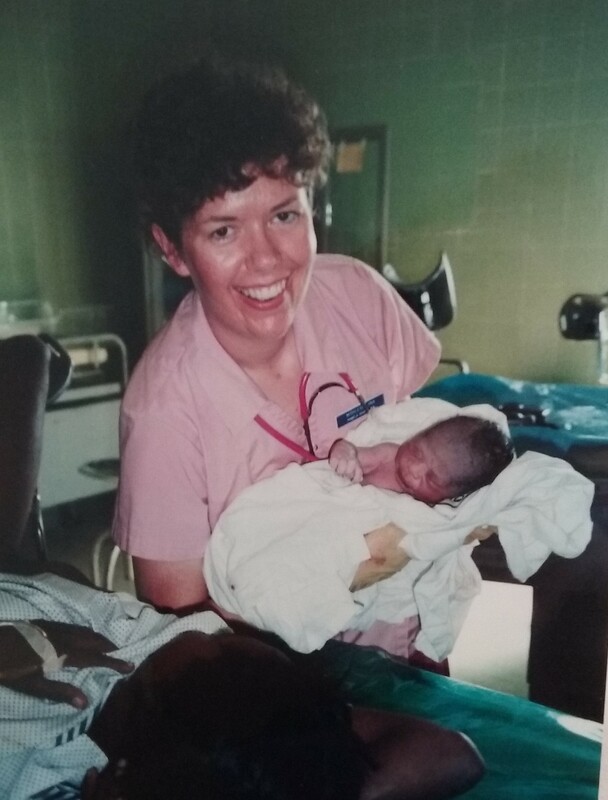 It has been 13 years since I worked in labor and delivery, so I silently prayed, Dear Lord, help me bring this new baby into the world safely. Amen. The mother gave two pushes and the baby came out with a cord around his neck once which the Dominican nurse quickly removed so he wouldn’t strangle. The baby boy let out a loud scream, and we all breathed a sigh of relief. Then the nurse put two clamps on his cord, cut it, and motioned me to carry him to the bassinette. I rubbed him down and gave him an Apgar score of 8 at 1 minute, and 9 at 5 minutes which is totally normal. Thank you, Lord. The nurse gave me a sterile string and motioned me to tie the cord closer to his abdomen. I tied my best Girl Scout square knot, and asked if I did it right? “Si!” (yes). Then Julie cut the cord again between the clamp and the string. They removed the 2 clamps so they could sterilize them and reuse them. We examined the cord, and it had the normal three vessels. Julie and Paula then delivered the placenta. I handed the baby to Mom and she began to breastfeed him. After the nurse cleaned Mom, she stood up, walked to the wheelchair, and was wheeled down the hall to the postpartum area. Mom never screamed the whole time, but only grimaced. She made childbirth look easy. After we settled Mom in bed, she thanked us profusely, while hugging and kissing each of us. The other students had never participated in a delivery before, so we were all thrilled. The miracle of birth never ceases to amaze me. God is so magnificent! Holding the new baby after I delivered it! Mom brought two disposable diapers with her. I saw a price tag of three pesos on one which equals 25 cents in the US. This is lots of money for her. Each patient is only given one bedsheet for their entire stay. We then made rounds on the rest of the hospital. The men’s ward had twenty beds with quite a few men in traction with femur fractures from motor scooter accidents. We then went back to the ICU. The three patients we saw yesterday are about the same. The lady with high blood pressure had a stroke rather than a blood clot in her lung. Her right pupil was enlarged and non-reactive to light. Her left arm was limp, but she could move her left leg. I checked her blood pressure, and it was back up to 196/110 and her heart rate was only 56. There was a new lady who had an asthma attack and was on oxygen. They had the head of her bed propped up with a chair since there is still no electricity today. Through Tammy’s interpretation, I found out more about, Martha, the ICU nurse. She works nine days out of fourteen with two days in a row on each shift, and then she has two days off. Dr. Elaine said nurses and doctors are not respected in the Dominican culture and the pay is low. The head nurse makes the equivalent of $120 per month in U.S. dollars. We then met with a lady in charge of infant feeding who has a doctorate degree from Santo Domingo. She showed us their beautiful classroom with a TV and video player. Mothers complete an 18-hour course of nine two hour classes on infant care. They have posters all over the hospital forbidding baby bottles and other posters showing a beautiful dark haired Mom breastfeeding her baby. This hospital has 190 beds for the whole region, which is not enough. They had 4000 births in 1993, and 6000 births in 1994. At the end of the day, I rode back to the clinic Dominican style taxi, on the back of a motor scooter, hanging on to the driver for dear life and asking the Lord for safety the whole way. Then I paid him the going rate of three pesos – 25 cents. What a full day.